This February, watching the ubiquitous diamond jewelry advertisements leading up to Valentine's Day has given me pause. In December 2013, following the abrupt dissolution of a 10-year marriage, my first independent financial move was selling my diamond engagement ring and investing the profits in a savings account (and a pair of weapon-like heels). That account has grown over the past year, the dregs of grief seeding my independent financial security. Though I once treasured that diamond ring, I can't say I miss it terribly now. I do, however, still love diamonds. Engineered to draw the eye, diamonds are -- in my sister's words -- pretty and sparkly. They gleam and glimmer and glitter and glow as all good things do -- stars, disco balls, lightsabers, unicorns, the mid-morning sun on the San Francisco Bay. Like handbags and shoes, diamond rings are the accoutrements of everyday life for many American women. But unlike other objects, diamond rings powerfully inculcate gender differences and sexual status. They say, "I am taken," and a large ring says, "I am taken by a rich man that would crush your man, Darwinian-style." From ancient to modern times, societal traditions have been built around jewelry, traditions that have both restricted and expanded possibilities available to women; wedding jewelry exists in almost every civilization. Engagement rings come down to us from an eternal and honored tradition dating all the way back to... a De Beers ad campaign of 1947. In perhaps The Greatest Marketing Ploy of All Time, De Beers (the largest diamond cartel in the world) and Ayers (their advertising firm) capitalized on the economic boom that hit America following World War II, giving birth to the "Diamonds are Forever" slogan. The faux tradition caught on like wildfire in a society keen to institutionalize the nuclear family and reinforce traditional gender roles. The De Beers campaign suggested that two-months of the man's salary (Rosie the Riveter had gone back into the home by '47) should be spent on the ring, an economic strategy maximizing their market earnings potential while making poorer or cheaper men look like utter douchebags. Scholars note that jewelry is uniquely important for its association with "all the things with which man is most concerned: money, power, religion and love." Engagement rings are both a means to and a symbol of ownership of female sexuality, visibly communicating fertility and availability status. It's the pièce de résistance of patriarchal values. The female body becomes a projection of male honor: the diamond adornment reinforces her status as a beautiful object to be consumed, while marking her as possessed. 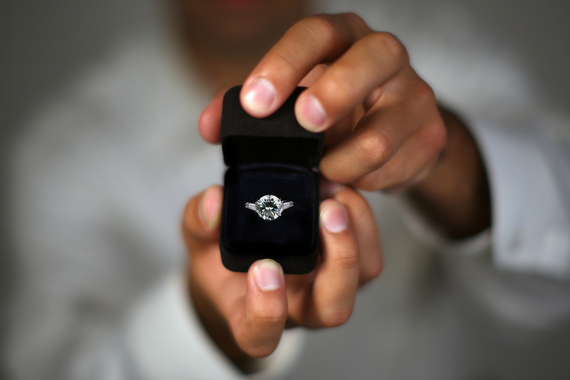 Engagement rings are a warning to other males -- the human equivalent of a dog peeing on a tree. The size of the ring conveys the financial potency (and by proxy, the virility) of her fiancé. Pretty primordial stuff. Perhaps no other quotidian object so constricts women into complicity to inferior status while simultaneously preying on the bête noir of traditional masculinity -- sexual and financial impotency. This is not as archaic or remote as it first sounds. In an office teeming with intelligent, ambitious women, my colleagues frequently comment on the beauty of each other's diamond rings. Such "compliments" imply nothing about the inherent merit of the woman. The beauty of one's engagement ring is unlinked to her intelligence, accomplishments, kindness -- an unearned and empty accolade. Jewelry has also -- paradoxically -- broadened the social options available to women, furnishing them them with agency. Historically, laws prohibited women from owning property, leaving them dependent on their husbands and destitute in the event of his desertion or death. Jewelry was the one exception to this rule. Considered personal property as distinguished from the real property (land) which men owned, jewelry functioned as the only source of wealth under the direct control of women. Legally, jewelry gifted from fathers and husbands was recognized as her property and asset, including any income she could generate from its sale. As a repository of wealth, jewelry had advantages: It was portable and could be liquidated quickly. And, as the only source of wealth under the direct control of women, jewelry often played a key role in their survival and independence. Jewelry meant women could support children after the death of a spouse, or contribute to rebuilding after a sudden financial crisis in the family -- a natural disaster or a husband's gambling addiction. Jewelry empowered women to leave abusive marriages (consider the story of a young wife climbing out of a window dripping with precious stones after a drunken beating from her husband -- the last, as it turned out). Holocaust survivor stories abound with examples of women's jewelry -- hidden in body cavities, sewn into clothes -- literally meaning the difference between life and death; objects meant to "adorn the body, were called on to save it." Diamonds have a rich, contradictory history, which makes them even more precious in my eyes. I'm interested in secret histories -- the stories and facts left out of the master narratives that govern our lives so thoroughly that they're invisible. Personal and social change is only possible when we become conscious of these equally true but lesser known stories, stories that have been forgotten or obscured because they did not serve those in power. I'm not saying we should ban engagement rings. I am suggesting that we not be passive consumers of accepted mores and their material representations. I'm suggesting increased thoughtfulness about what these objects mean to us and what deeper societal constructs they reinforce both personally and socially. That we make more informed decisions about what we choose to embrace and let go of. I'm suggesting that we remain cautious about which traditions we choose to propagate. Diamonds may be forever -- but all that glitters is not gold.